The Players: Mrs. Marie Muller Kavanaugh (AKA Mrs. George Washington Kavanaugh), Elizabeth Wharton Drexel (AKA Lady Decies), and an unidentified woman. Mrs. Marie Muller Kavanaugh (1867-1954) was born in Washington D.C. She attended around 30 Metropolitan Opera season openings. She lived at 10 East 62nd St. She was well-known, featured in many “society” columns (on May 12, 1939, The New York Times reported that Mrs. George Washington Kavanaugh gave a large reception for Lady Decies that featured “masses of roses, gladioluses and other variegated Spring blossoms”), and for many years was photographed at the opening nights of the Metropolitan Opera. Life magazine (January 4, 1937), in an article “Flashlight Night at the Opera,” reported that “No operagoer wore orchids or ermine or diamonds with more verve than Mrs. George Washington Kavanaugh, shown with her daughter, Mrs. Leonora Warner.” Perhaps inspired by “The Critic,” a December 18, 1944 article in Life, “Life Goes to Opening Night at the Opera with Mrs. George Washington Kavanaugh,” (with photos by Marie Hansen and Gjon Mili) we follow Mrs. GWK before, during, and after the opening night. That’s life. In 1943, The Museum of the City of New York in co-operation with the Metropolitan Opera Guild presented an exhibition to celebrate the diamond jubilee of the Metropolitan Opera House (1883-1943). It was an exhibition of costumes, props, memorabilia, photos, and theatrical odds and ends. The exhibition included treasures, such as the original program from the inaugural production, Faust (Charles Gounod, 1859). “From the magic property rooms of the Metropolitan Opera House come treasures long such hidden away in dust and cupboards, such as a dented bronze cup from the first Tristan, a rusted swan’s collar from a Lohengrin, a candelabrum from the first presentation of Tosca, a helmet from Aida, Fidelio’s candlestick, a peacock plumed helmet from L’amore dei tre re and many more fascinating relics… and a board from the stage floor so often trod by Caruso, Farrar and their honored confreres. A lamp used prior to electricity at an exit provides a note of nostalgia.” (Brooklyn Eagle, November 21, 1943, p.36). To set the scene: November 22, 1943 was a partly cloudy and cold Monday; three days before Thanksgiving. Weegee was 44 years old. Mrs. George Washington Kavanaugh was 76 and Lady Decies was 75. “The Critic” was presumably made shortly before 8 PM. 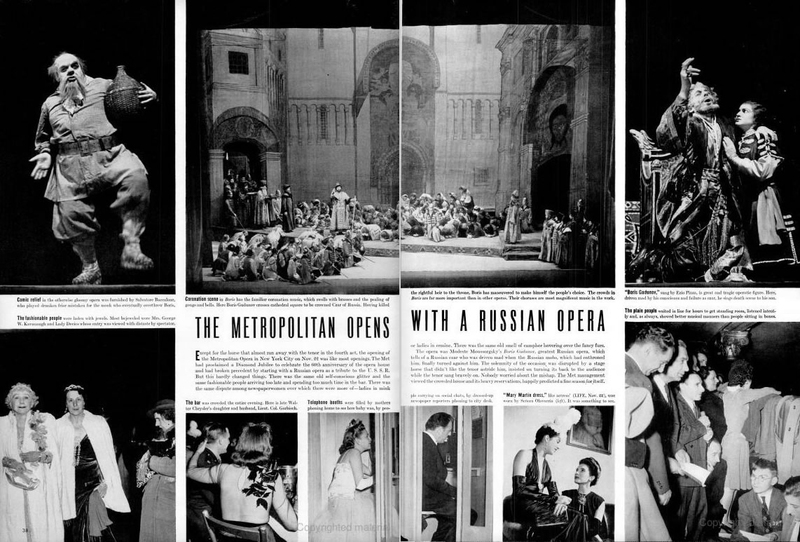 It was the opening night of the Met’s 60th season, or “Diamond Jubilee” year. In a salute to Russia the opera was “Boris Godunov,” composed by Modest Mussorgsky (1839-1881). Ezio Pinza sang the role of Boris Godunov; the conductor was George Szell. The line to buy standing-room-only tickets began forming at 4:30 AM. Except for the horse that almost ran away with the tenor in the fourth act, the opening of the Metropolitan Opera in New York City on Nov. 22 was like most openings. The Met had proclaimed a Diamond Jubilee to celebrate the 60th anniversary of the opera house and had broken precedent by starting with a Russian opera as a tribute to the U.S.S.R. But this hardly changed things. There was the same old self-conscious glitter and the same fashionable people arriving too late and spending too much time at the bar. There was the same dispute among newspaperwomen over which there were more of – ladies in mink or ladies in ermine. There was the same old smell of camphor hovering over the fancy furs. The crime teletype machine was quiet at police headquarters… so I decided to sneak away and go to the opening of the opera. I watched the last minute rehearsal. I had no invitation but my press card was enough. War or no war, the Rolls Royces, big and shiny, kept arriving. Some had two chauffeurs with the usual gas ration sticker in the windshield. I guess if they ran out of gas one would steer while the other one would push. I took stock of the situation. It was a cold night. Inside the warm lobby about two dozen photographers were lined up Wolf Gang Fashion. If one flashed a bulb all the others did too. It was like a game of “follow the leader.” This is a big night for the cameramen, with the papers and syndicates sending only high class photographers who know society to cover because before a paper will publish a photo of the opening night the subject’s name must be listed in the Social Register. The theatre was jammed so I went into the grand tier where the board of directors of the Metropolitan Opera house have their private boxes and picked myself a nice private box. There was another occupant, a director who kept his high silk hat on. I gave him a couple of dirty looks but he paid no attention to me or to the usher, who was evidently afraid to go near him. During the intermission I went into the packed salon to watch what was going on. Cameramen were shooting fast and furious. Press agents, seeing my camera, pointed out notables to me but I refused to waste film or bulbs as I don’t photograph society unless they have a fight and get arrested or they stand on their heads. …From his place on the sidewalk, Weegee signaled Liotta, who released the disheveled woman and gave her a little nudge into the frame. Judging by the photograph, she is reeling, barely able to stand. 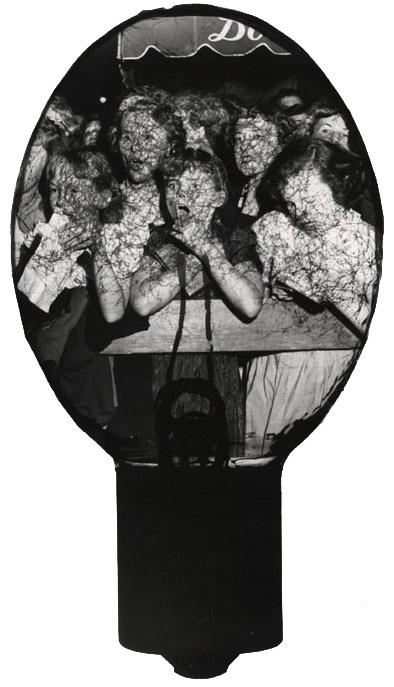 If there was one thing Weegee knew from being in a scrum of press photographers, it was how to make a few shots very quickly, swapping in sheets of film and flashbulbs as fast as he could. Flash: He caught Mrs. Kavanaugh and Lady Decies as the third woman observed them. Flash, again, a moment later, as the two ladies turned, passed him, and stepped into the lobby, facing half a dozen other photographers with the same tight smiles. Much later, Liotta told the journalist Joyce Wadler that there were three or four bulbs set off, almost too fast for him to parse. That was it. No different from shooting outside police headquarters any day of the week. This entry was posted in Fans in a Flashbulb and tagged 1943, Manhattan, Metropolitan Opera, New York, New York City, opera, The Critic, The Critic at 75, Weegee. Bookmark the permalink.